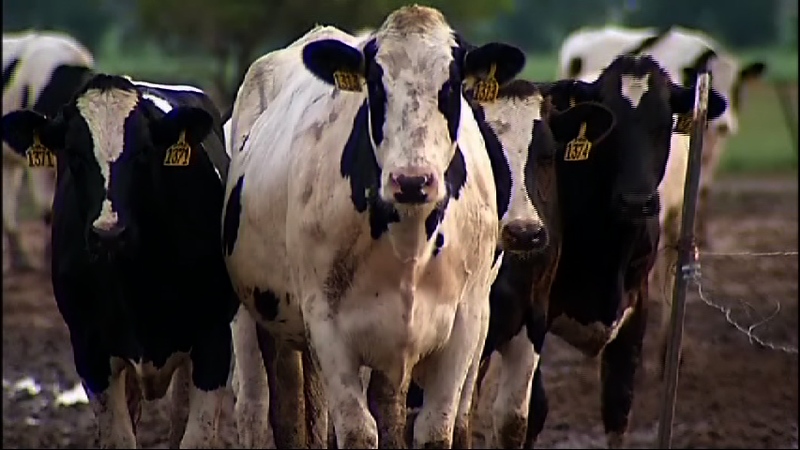 (CBS) MIAMI - The group Mercy For Animals (MFA) posted the videotaped abuse of cows at Bettencourt Dairies in Idaho on YouTube Tuesday, CBS Miami reports (warning: graphic video). An undercover investigation by MFA captured what the group calls "sadistic animal torture" on its hidden cameras at the major Kraft and Burger King cheese supplier in Idaho. Three workers have been charged with criminal animal cruelty charges and were fired by Luis Bettencourt, the dairy owner, who says that he is sickened by the video. The description of the video by Mercy for Animals says the dairy workers were caught "viciously beating and shocking cows and violently twisting their tails in order to deliberately inflict pain." Additionally, it says, the hidden camera captured "extremely unsafe and unsanitary conditions, including feces- covered floors that cause cows to regularly slip, fall, and injure themselves" and "sick or injured cows suffering from open wounds, broken bones and infected udders left to suffer without veterinary care." The video shows a cow being dragged on the floor by a chain attached from her neck to a moving tractor. MFA is urging Burger King to implement meaningful animal protection guidelines for all dairy suppliers that includes a zero tolerance for animal abuse, care for ailing "downers," and an end to mutilations without painkillers.